“Any questions?” asked Cllr. Harry Phibbs (Con), the Chair at last night’s Value for Money Scrutiny Committee. My two Labour colleagues and I had decided to allow the majority six Conservatives (five showed up) to ask their questions first, so I said we would defer to them. Then, after a seemingly endless silence, an uncomfortable “Everyone else is happy” was nervously offered up by one of that committee’s former Tory chairs. She was indicating that none of the Conservatives intended to ask a single question about the management of the borough’s £184million annual budget. Last night’s meeting had been set to be the most important of the year but it didn't play out like that. To start, Cllr. Stephen Greenhalgh, (Con) the Leader of the Council and Cllr. 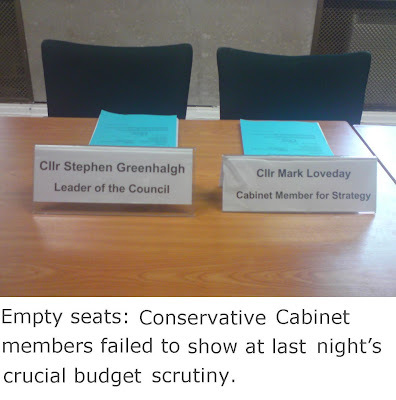 Mark Loveday (Con) the Cabinet Member for Strategy, failed to turn up or send anyone else from the Cabinet to answer to the Committee. Indeed, only a small number of council officers attended but they soon admitted that they were incapable of answering most of my questions with any substance. We ended up in a farcical situation with my Labour colleagues and I spending over an hour asking questions about the deliberately vague terms, laid out in the report, that describe each of the Council’s cuts. This was met with a long line of officers' responses that went along the lines of “I’m guessing that’s about… but I’ll check that out and write to you”. On a couple of occasions, the Conservative committee members who were supposed to be scrutinising the Administration ended up answering for it. There was serious business to be done last night but the circumstances made it impossible for that to happen. Last February, the Conservative Administration agreed the budget with the same degree of rubber stamping only to find that three months later it was in “crisis” as there was already over a £2million overspend by May. This was only solved by raiding balances. There is much to be concerned about the robustness of the figures put forward in this year’s budget report. Parts of it are clearly little more than fantasy but I will report on that later. My rub at the moment is that this Administration’s scrutiny process doesn’t work. To be fair to Cllr. Phibbs, he is the most proficient of the four Tory chairs that committee has had in the last four years. But, it’s worth noting that, with the exception of the first incumbent, the others never even got to grips with the most basic aspects of their responsibilities. Evenings were wasted listening to sycophantic exchanges 'toing and froing' between Tory backbenchers and Tory frontbenchers. Indeed, this problem is much the same across all the current scrutiny committees which have barely evolved from the earliest days. The current scrutiny process is so dire that my Labour colleagues and I agree that if we had a clashing council commitment in our diary, such as a residents’ association meeting, then we’d go to the other instead. There’s an election on May 6th. If my colleagues and I form the next Administration we will scrap all but the statutory scrutiny committees. We will replace them with Select Committees – much as they have in Parliament. These will involve residents and local groups. They will be charged with seeking out genuine value for money and improvements in services.